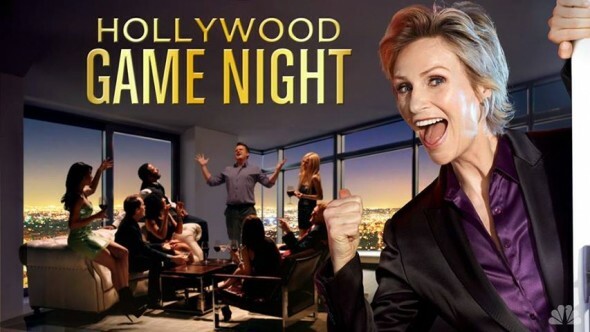 Hosted by Jane Lynch, this game show invites viewers to imagine themselves at a fantastic party in the Hollywood Hills for a night of casual games and a chance to win big money. As the house band rocks, regular people mingle with celebrities. Then, two contestants each team up with a celebrity to compete in a series of outrageous games. The winner takes home $25,000 in cash. Celebrity guests include Jason Alexander, Anthony Anderson, Tom Arnold, Rose Byrne, Nick Cannon, Kristen Chenoweth, Josh Gad, Max Greenfield, Patricia Heaton, Felicity Huffman, Hoda Kotb, Dominic Monaghan, Al Roker, Will Sasso, Molly Shannon, and Wilmer Valderamma. What do you think? Do you like the Hollywood Game Night TV series? Do you think it should be cancelled or renewed for another season? Love that game, funny and smart. All the good stuff gets cancelled. Why oh why can’t I find episodes of Hollywood Game Night anymore??? This is the most fun show I have ever seen. I laugh through the whole show and I live the games! PLEASE do NOT cancel this show. It is the best. There are a lot of good shows are they, but they are not good for me. This is a very good and funny show that’s also good for me. Would love to see an actual board game like this. Please let us know when it’s going to be on again.